Southern Clinics of Istanbul Eurasia - SCIE (formerly Kartal Eğitim ve Araştırma Hastanesi Tıp Dergisi - The Medical Journal of Kartal Training and Research Hospital) is published four issue in English by the Kartal Dr. Lütfi Kırdar Training and Research Hospital, and is a peer reviewed general medical journal for all physicians, doctors, medical researchers, and health workers. The journal reports the advances and progress in current medical sciences and technology. The journal covers basic and clinical studies in medicine. Articles of clinical interest and implications will be given preference. Contributions may be in the form of clinical and basic research articles, case reports, personal clinical and technical notes, and letters to the Editor. The Journal also publishes brief reports on original studies or evaluations, book reviews, and proceedings of scientific meetings. The Editor-in-Chief may request from the authors additional data, information, or complementary material concerning the manuscripts, and the authors must comply with such requests. An approval of research protocols by the Ethics Committee in accordance with international agreements (World Medical Association Declaration of Helsinki “Ethical Principles for Medical Research Involving Human Subjects,” amended in October 2013, www.wma.net) is required for experimental, clinical, and drug studies and for some case reports. If required, ethics committee reports or an equivalent official document will be requested from the authors. All manuscripts presenting data obtained from research involving human subjects must include a statement that the written informed consent of the participants was obtained and that the study was approved by an institutional review board or an equivalent body. This institutional approval should be submitted with the manuscript. Authors of case reports must submit the written informed consent of the subject(s) of the report or of the patient’s legal representatives for the publication of the manuscript. All studies should be carried out in accordance with the World Medical Association Declaration of Helsinki, covering the latest revision date. Patient confidentiality must be protected according to the universally accepted guidelines and rules. Manuscripts reporting the results of experimental studies on animals must include a statement that the study protocol was approved by the animal ethics committee of the institution and that the study was conducted in accordance with the internationally accepted guidelines, including the Universal Declaration of Animal Rights, European Convention for the Protection of Vertebrate Animals Used for Experimental and Other Scientific Purposes, Principles of Laboratory Animal Science, and the Handbook for the Care and Utilization of Laboratory Animals. The authors are strongly requested to send the approval of the ethics committee together with the manuscript. In addition, manuscripts on human and animal studies should describe procedures indicating the steps taken to eliminate pain and suffering. The official language of the Journal is English. Articles may be submitted in Turkish and will be translated to English. A technical review is performed to confirm that all of the required documentation has been submitted and to conduct a preliminary evaluation of the manuscript and supplementary files to assess suitability for the Journal. The manuscript will be returned to the Author in the event of any deficiency. The Editorial Office of SCIE then assigns the manuscript a number and begins the peer preview process. This journal operates a blind review process. Contributions deemed suitable are then typically sent to a minimum of two independent expert reviewers in the field of study to assess the scientific quality of the paper. The Editor is responsible for the final decision regarding acceptance or rejection of articles. The Editor's decision is final. The authors should disclose all issues concerning financial relationship, conflict of interest, and competing interest that may potentially influence the results of the research or scientific judgement. All financial contributions or sponsorship, financial relations, and areas of conflict of interest should be clearly explained in a separate letter to the editor at the time of submission, with full assurance that any related document will be submitted to the Journal when requested. Manuscripts should be sent with the Copyright-Authors’ Approval-Conflict of Interest Letter signed by the author(s). A copy of this letter can be found at web site. Manuscripts will not be accepted for evaluation until the receipt of this document by the Journal. The Editorial Office inspects all submitted manuscripts concerning plagiarism and duplication. 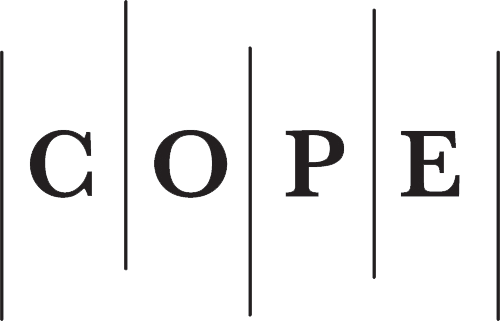 If an ethical problem is detected, the editorial office will act according to the COPE guidelines. All published material will become the sole property and will be copyrighted by the Journal. No part of the publication may be used without prior written permission of the publisher. Articles and illustrations become the property of the Journal after publication. The SCIE is an open access journal which means that all content is freely available without charge to the user or his/her institution. Users are allowed to read, download, copy, distribute, print, search, or link to the full texts of the articles, or use them for any other lawful purpose, without asking prior permission from the publisher or the author. This is in accordance with the BOAI definition of open access. Creative Commons Attribution-NonCommercial 4.0 International (CC BY-NC 4.0) For non-commercial purposes, lets others distribute and copy the article, and to include in a collective work, as long as they credit the author(s) and provided they do not alter or modify the article. SCIE accepts only on-line submission via the official web site (please click, http://www.scie.online/en/?s=online_submission) and refuses printed manuscript submissions by mail. All submissions are made by the on-line submission system called Journal Agent, by clicking the icon “Online manuscript submission” at the above mentioned web site homepage. The system includes directions at each step but for further information you may visit the web site. Before the corresponding author submits the manuscript, all authors must obtain ORCİD ID number and provide it to the corresponding author. The author(s) must declare that they were involved in at least 3 of the 5 stages of the study stated in the “acknowledgement of authorship and transfer of copyright agreement” as “designing the study”, “collecting the data”, “analyzing the data”, “writing the manuscript” and “confirming the accuracy of the data and the analyses”. Those who do not fulfill this prerequisite should not be stated as an author. In multi-center or multi-discipline studies, each author’s contribution regarding the 5 stages mentioned above should be stated clearly. For this kind of multi-center or multi-discipline studies with excessive number of authors, the editor has the right to request that the number of authors be reduced. From the beginning of introduction to the end of discussion, clinical, basic and experimental studies should not exceed 2,500 words, case reports and surgical techniques 1,500 words, letters to the editor 350 words. Manuscripts exceeding these limits will be returned to the author(s) to be shortened. Title page: This page should only include the title of the manuscript, which should be carefully chosen to better reflect the contents of the study. Author names should not appear in the title and subsequent pages. Abstract: It should not exceed 300 words. Abstracts should be structured in four paragraphs using the following subtitles: Objectives, Methods, Results, and Conclusion. Abstracts of case reports should be unstructured. Main text: The body consists of Introduction, Patients/Materials and methods, Results, and Discussion. Use “Patients and methods” for clinical studies, and “Materials and methods” for animal and laboratory studies. The Introduction section clearly states the purpose of the manuscript and includes a brief summary of the most relevant literature. The Patients/Materials and Methods section describes the study population and the study design, with adequate information on the techniques, materials, and methods used. A clear description of the statistical methods should also be given. The Results section should provide a detailed report on the findings of the study. Data should be concisely presented, preferably in tables or illustrations, which should not exceed the page layout of the Journal. The Discussion section should mainly rely on the conclusions derived from the results of the study, with relevant citations from the most recent research. Letter to the Editor: Letters to the editor should not exceed 350 words. References: References should be numbered in the order in which they are mentioned in the text. Only published articles or articles in press can be used in references. Unpublished data or personal communications should not be used. The style should conform to the standards described in detail in “Citing Medicine-The NLM Style Guide for Authors, Editors, and Publishers” (http://www.nlm.nih.gov/citingmedicine), which is recommended in the most recent update of “Uniform Requirements for Manuscripts Submitted to Biomedical Journals”. A brief presentation of these standards can also be found at http://www.nlm.nih.gov/bsd/uniform_requirements.html. Journal titles should be abbreviated according to the Index Medicus. 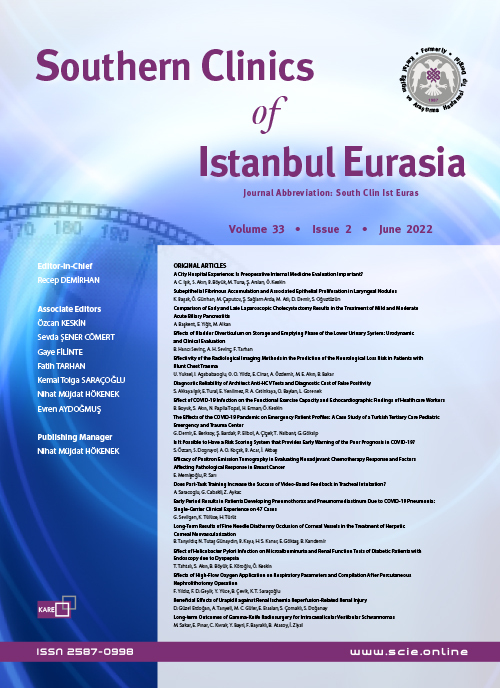 The Journal’s title is abbreviated as “South Clin Ist Euras”. Napolitano LM, Corwin HL. Efficacy of red blood cell transfusion in the critically ill. Crit Care Clin 2004;20:255-68. All authors if six or fewer should be listed; otherwise, the first six and “et al.” should be written. Rupprecht H, Heppner HJ, Wohlfart K, Türkoglu A. The geriatric polytrauma: Risk profile and prognostic factors. Ulus Travma Acil Cerrahi Derg 2017 Jan 05. doi: 10.5505/tjtes.2016.77177. [Epub ahead of print]. Enzingerz FM, Weiss SW. Soft tissue tumors. St. Louis: Mosby; 1995. p. 27-50. Günal İ, Barton NJ, Çallı İ, editors. Current management of scaphoid fractures. Twenty questions answered. London: The Royal Society of Medicine Press; 2002. Henick DK, Kennedy DW. Fungal sinusitis. In: Stankiewicz JA, editor. Advanced endoscopic sinus surgery. St Louis: Mosby; 1995. p. 69-80. Kouzelis A, Matzaroglou C, Kravvas A, Mylonas S, Megas P, Gliatis J. Anterior cruciate ligament reconstruction: patellar tendon autogaft versus four strand hamstring tendon. In: Proceedings of the 9th Turkish Sports Traumatology, Arthroscopy and Knee Surgery Congress; 2008 Oct 14-18; İstanbul, Turkey. p. 223. Unpublished conference papers should not be used in the reference list. Direct use of references is strongly recommended and the authors may be asked to provide the first and last pages of certain references. Publication of the manuscript will be suspended until this request is fulfilled by the author(s). All illustrations (photographs, graphics, and drawings) accompanying the manuscript should be referred to as “figure”. All figures should be numbered consecutively and mentioned in the text. Figure legends should be added at the end of the text as a separate section. Each figure should be prepared as a separate digital file in “jpeg” format, with a minimum of 9×13 cm and at 300 dpi or better resolution. All illustrations should be original. Illustrations published elsewhere should be submitted with the written permission of the original copyright holder. For recognizable photographs of human subjects, written permission signed by the patient or his/her legal representative should be submitted; otherwise, patient names or eyes must be blocked out to prevent identification. Microscopic photographs should include information on staining and magnification. Upon the author’s request, color prints will be considered for publication; however, the authors are responsible for the extra cost of printing color illustrations. Each table should be prepared on a separate page, either at the end of the text file or as a separate supplementary file, with table heading on top of the table. Table heading should be added to the main text file on a separate page when a table is submitted as a supplementary file. If a brand name is cited, supply the manufacturer’s name and address (city and state/country).